The menu and photos of the Supper held on the 18th January 2019 have been uploaded. Thanks to Nick Manton for taking the pictures. This entry was posted in Uncategorized on January 24, 2019 by Malcolm Sharp. The menu and photos of the Supper held on the 19th January 2018 have been uploaded. Thanks to Graeme Sharp for taking the pictures. This entry was posted in Uncategorized on January 22, 2018 by Malcolm Sharp. 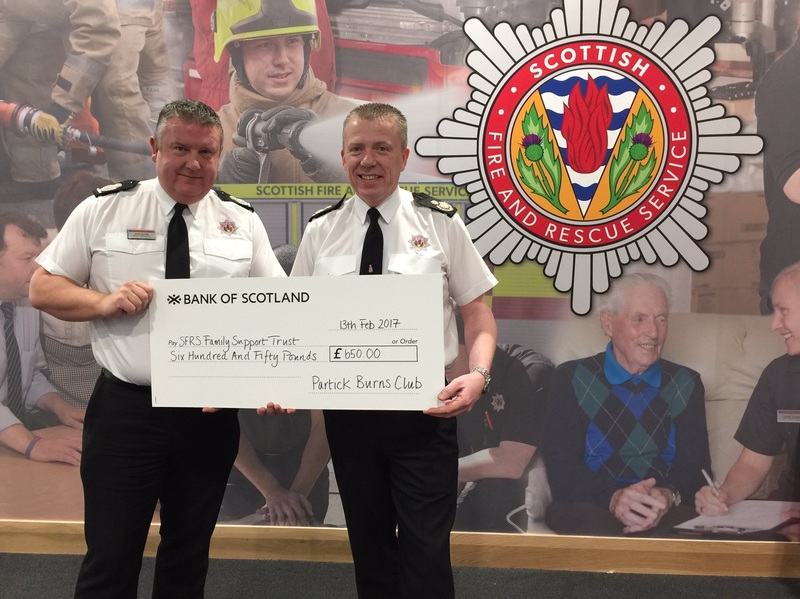 I have received a photo from our new president Robert Scott of our charitable donation of £650 being made to Deputy Chief Officer Alex Clark, chair of the Family Support Trust on the 13th February in Newbridge. The Trust are extremely grateful to the PBC. Many thanks to all our members and guests who contributed. This entry was posted in Uncategorized on February 15, 2017 by Malcolm Sharp. The menu and photos of the Supper held on the 20th January 2017 have been uploaded. This entry was posted in Uncategorized on February 2, 2017 by Malcolm Sharp. A big thank you to Mat Morton who sent in supper menus for 1994, 1998, 1999, 2000, 2002, 2003, 2005 and 2008. These have been scanned and added to the table of menus that can be downloaded from the ‘Past Suppers’ web page. This entry was posted in Uncategorized on February 22, 2016 by Malcolm Sharp. The menu and a photo of the top table and their guest speakers for the Supper held on the 22nd January 2016 have been uploaded. This entry was posted in Uncategorized on January 28, 2016 by Malcolm Sharp. The photos from the 2015 supper have been posted.